This recipe for Easy Fall-off-the-Bone Ribs is deeeeelicioius! 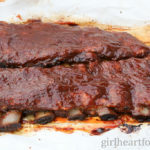 A simple spice mix combining both sweet and spicy components are blended together; the ribs are massaged with the spices and baked for a bit. After, they are brushed with your favourite barbecue sauce and grilled. Then, all that’s left to do is dig in!